For the couples that are just recently getting engaged and were hoping for a Spring wedding in 2018 but can’t seem to find an available venue? Or looking for that unique venue with a little bit of rustic mixed with modern amenities like access to a bar, parking, restrooms, separate event spaces, A/C, and heat? We may be just the perfect venue for you! We are so excited to showcase our venue and to work with couples and event planners for the 2018 wedding season. Being under construction poses its challenges – we get that. While our construction is on schedule and going well, we got started a little later than the standard year-out from the start of the Spring/Summer wedding season starts. 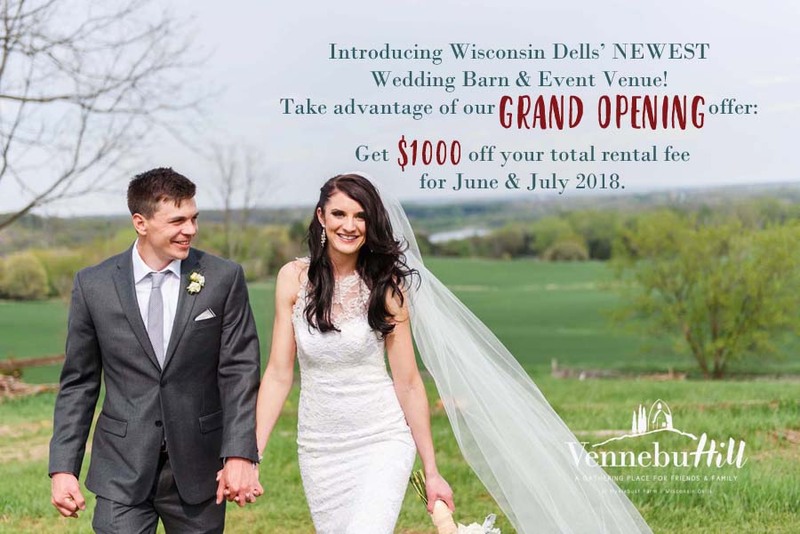 For this reason, Vennebu Hill is offering $1000 off your rental fee for weddings in June & July. Take advantage of this excellent grand opening offer extended until March 1, 2018. We will take our first reservations for events in June 2018. We, at Vennebu Hill, realize its hard to commit to a venue that is under construction. We are working around the clock to ensure that by the 2018 Wedding Season, Vennebu Hill will be the wedding venue of your dreams. We are doing routine weekend site tours, so schedule yours today! Call 608.408.9491 or email vennebuhill@gmail.com.